Recycling is a process that converts waste materials into new products. It adds delivers environmental benefits such as energy, material and landfill space conservation. Recycling is seen as the right thing to do, and can be a source of individual as well as civic or corporate pride. While recycling is the right thing to do, it is equally important to do it right. Recycling mistakes can make things worse instead of better. Recycling the appropriate items in the appropriate condition helps ensure that we create recycled materials that have the best quality and value while being processed in the most cost-effective manner. The tolerance of recycling programs for dirty or contaminated materials has decreased in recent years in large part due to strict quality standards set by China for imported scrap. These restrictions have had a ripple effect on scrap markets and recyclers, who have had to adhere to higher quality standards. For community recycling programs to work effectively, it is more urgent than ever to adhere to your recycling program requirements. Plastic bags Not many communities accept used plastic bags in a commingled recycling stream because they can be difficult to sort and clean. Look for other options such as retailers like Wegmans that accept plastic bags. Plastic container lids Loose plastic caps from bottles should go in the trash while metal bottle caps may be accumulated inside a metal can, only if effectively crimped so as to trap them during the collection and sorting process. Remember that small items typically cannot effectively handled in recycling conveyor systems. Larger lids are typically removed and included in recycling. Again, check to see what your program allows. Non-recyclable glass Not all glass can be recycled. Translucent jars and bottles can be recycled, if your recycling program accepts this type of glass. However, light bulbs, Pyrex products, lab glassware, mirror and window glass are usually not accepted for recycling. Lighting products are beginning to be more widely accepted in special recycling programs, such as B.C. 's Lightcycle lighting recycling program. Greasy food packages Paper and paperboard material is regularly accepted by recycling programs, but leave out the food soaked or greasy paper which can negatively impact recycled paper quality. There are increasingly new options, however. Greasy paperboard material often may be accepted with organic waste, for example. Containers with liquids still inside This is a very common mistake. Some people just throw their liquid containers into the recycling bin without emptying them first. If there is liquid inside, it may spill and contaminate other commingled materials such as paper. Additionally, containers carrying liquid are heavier than empty containers, and this may lead to inaccurate sorting at the recycling plant. Loose shredded paper Shredded papers are acceptable to most recyclers if you put the shredded papers in a paper bag and label it as “Shredded papers”. Otherwise, sorting out shredded paper from other materials becomes very difficult in a material recycling facility. Additionally, while many programs only accepted a limited range of paper in the past, now many of them accept a wider range of colored and glossy paper. Other items Other items not allowed in community recycling programs include medical waste and disposable diapers. Polystyrene foam, while being recyclable, is often not accepted. 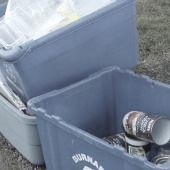 Be sure to check what is allowed in your recycling program. What about labels? Many people think it’s important to remove labels from can and containers. But this is a completely unnecessary step for thermal recycling processes that burn them off. Save your valuable time and use of hot water by not doing this. It is important to do your homework when it comes to eliminating recycling mistakes. Most communities will have recycling information available online or through an information sheet. Take a few moments to ensure that you are recycling only acceptable materials. Just because an item can be recycled does not mean that your community accepts it as part of its program, and just because they take the item in a certain condition, such as rinsed and clean, does not mean they can accept it if dirty. When the wrong items are included in the blue box, the result is a much greater cost to divert the residual material to the landfill, a situation that can reduce the value of recovered material, increase handling costs, and threaten the viability of the overall recycling program. Are You Making These 7 Common Recycling Mistakes?